Since man had the capability to harness fire and chisel rock, we have had a thirst and want to wage war. War is among the most ancient and storied of human practices, and as a result there is an emotional undercurrent stronger than that of many of today’s religious practices. This emotional undercurrent is such that it has driven town against town, neighbor against neighbor, and even brother against brother. With such a strong current of emotion, it should come as no surprise that war has been so romanticized over its history and carries with it the chance to inspire so much art. World War Two is no different from any other war in this aspect, and Soviet Culture, while unique, is not above romanticizing its conflicts and painting a picture of bravery, honor, hope, loss and patriotism by idealizing the struggle which its armies faced. This is a picture of Klavdiaa Shulzhenko. 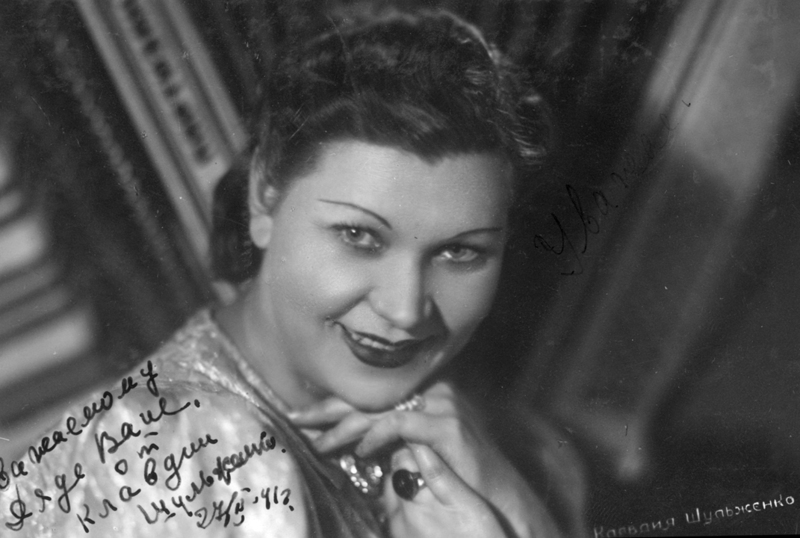 She became a widely famous singer during World War II. Her kindness lead her to be loved and admired by many Soviet people. She entertained the Red Army by preforming regularly for them. Her renditions of “The Blue Kerchief” would become some of her most famous performances. This song is yet another example of poetry from the era that deals with love and war. The underlying theme is simply that the “boys” are fighting for their loved ones at home. The image at the top of this post encapsulates in simple beauty what love and romance meant in the USSR during WWII. 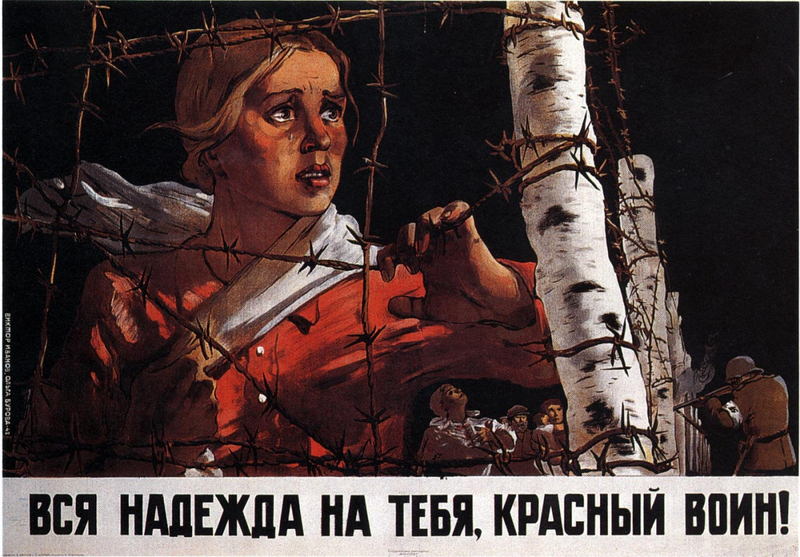 We see a beautiful young girl, a expression of hopelessness gripping her face, trapped behind barbed wire. The image carries the inscription that translates to, “Our hope is in you, Red Warrior!” The image carries with it three symbols that stand out above the rest. The first is the simple bright red tunic the girl is wearing. Red is the color of the USSR and was held as the most beautiful and patriotic of colors. Second, The barbed wire fence is supported by birch trees, which is the national tree of Russia. Finally, the girl is donning a whit kerchief, which became a symbol of hope and a promise that the “boys” would soon be home during WWII. All these components act together to create an image that resonates on a deeper, more emotional level with the Soviet viewer. They would have seen the image and been caught by the patriotism that it denoted, yet taken aback by the hopelessness of the girl’s situation. The statement at the bottom that looked to the “Red Warriors” for aid became all the more true as the men and women of the Soviet Union all saw a piece of themselves in that hopeless girl being ensnared by the Fascists within the confines of their own nation. This excerpt from the third stanza encapsulates the general theme of Soviet poetry from this era. While there is nothing overly special about the imagery or vocabulary used, there is a profound message conveyed through its simpleness. Though this soldier is miles away, though he is fighting through the cold and marching day after day, all he needs is his girl to smile, and the day will pass by with ease. The reader is immediately presented with the apparent struggle of the soldier, but again, this image is presented through the lens of love. This soldier is going through dark times, but it is alright because his girl is there to smile at him from on far. That smile is enough to carry him onward, and someday bring him home. The above video is of the striking and deeply emotional song, Dark is the Night by N. Bogoslovsky and V. Agatov. This further gives context to the idea that war is romanticized by the participants and that love is used as a means to cope with and present hope to a dark and dire situation. This song, like the picture and the poem all share the common themes and serve to relay a common message of love and its intertwined being with war. Loss and struggle, hope and love, these are the underlying themes that are ever present in the artwork and poetry of the USSR at war. What does all of this mean, what was the point? What purpose was love meant to give to the people? When man finds himself in a situation that seems all consuming and without the chance of escape, he will cling to any small shred of hope that he sees. These works served as that ray of light in a dark time. It gave the people of the USSR a hope that one day their friends, family and loved ones would be returned to them and the nation would again be free from conflict. While these works portray women in a stereotyped way, that went against the norms called for by typical socialist standards, they gave a way for the men on the front to feel that home was not so far away. They bridged the long gap from war front to home front by evoking the emotion of love and giving the “Red Warriors” a glimmer of the brighter tomorrow that peace promised. From the standpoint of the romantics that published these works during World War II, the reason they fought was as simple and ideal as the statement, so they could protect their loved ones and one day return to them. They presented their work through the lens of love for, “… there is no fear in love…” and it all but alleviates the sense of foreboding so deeply associated with war. War carries with it death, destruction and loss, so for the “Red Warriors” it was a simple matter of fighting for those they loved so they would not know that which war brings with it. You found some great sources again, some very eye opening sources. There are always pictures of the evil of Germany, but this is new to me to see Russia as something beautiful and innocent. I think this is my favorite comment of the semester so far!